Mattishall tower windmill stood on the northwest side of the village and was originally built in Mill Street. 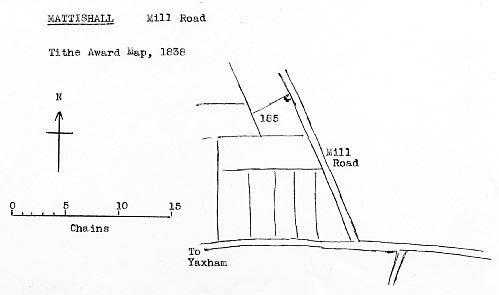 In later years after the mill had been dismantled, the road name was changed to Mill Road, possibly at the same time as the nearby Town Lane was renamed Mill Street. The mill ran two pairs of French burr stones and a flour mill. On Friday September 21, 1787 between the Hours of Two and Five in the Afternoon, at the Eagle in East Dereham. A Compleat WINDMILL with a Pair of excellent French Stones and Flour Mill, now in full Trade, standing in Mattishall near the Turnpike Road from Norwich to Dereham. Dereham is the best Corn Market in the County. For further Particulars enquire of Michael Dexter in Mattishall, who will shew the Premises. Michael Dexter was the son of Robert Dexter, miller at Garveston_postmill. Michael Dexter was baptised in September 1754, St Margaret's Church, Garveston and later married Dorothy Bell Springall on 18th October 1779, at All Saints Church, East Tuddenham. A POST WINDMILL in Mattishall in Norfolk, in which is a Flour Mill, two pair of French stones with good going gears and about one acre and two roods of land. Also about two acres of land at Mattishall Bergh adjoining Mrs. Hardy's plantation. Mattishall is only 4 miles from Dereham, 12 from Norwich, 8 from Wymondham and 12 from Watton. Apply to Messrs. SEWELL & BLAKE, Solrs. Norwich or to Mr. Overton, Mattishall who will shew the premises. Christmas Tofts, farming Steward of Little Walsingham made a will on 16th December 1834, leaving to his wife Mary Tofts and sons James & William Tofts all that windmill and messuages, lands, tenements, situate and lying and being in Mattishall etc. Daughter Charlotte Tofts is also mentioned in the wlll, which was proved on 30th November 1835. Christmas Tofts may well have been known as John Tofts. Auction by Mr. Wilde, Kings Head, East Dereham, 28 September 1855 at 3 o'c. Lot 7. TOWER WINDMILL, and Outbuildings, Mattishall. 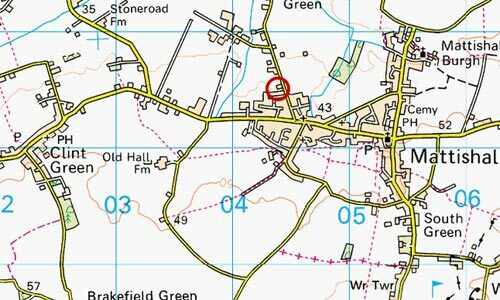 All that Freehold Messuage with the stables, outbuildings, garden and piece of land together with the Windmill, in the occupation of John Sendell, containing with site of buildings 1a. 1r. 22p. James Tofts James Tofts . . The Sendall family also owned the Mill_Street_towermill.